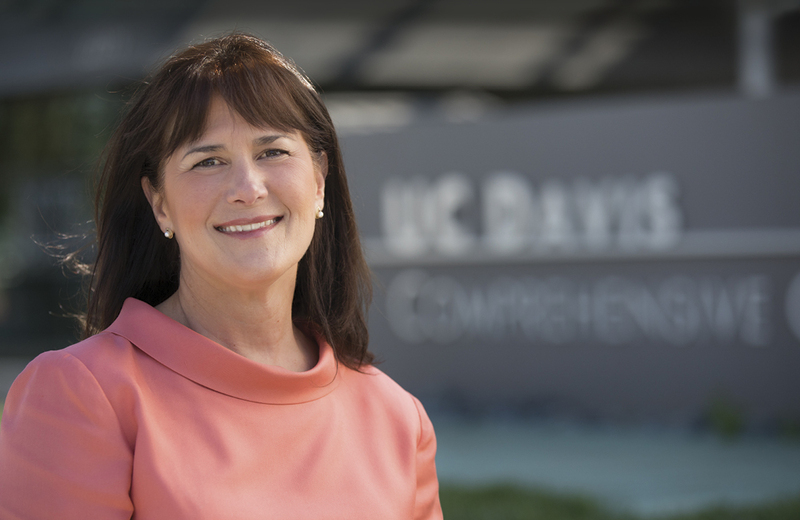 JEANINE STILES has been in the saddle as the UC Davis Comprehensive Cancer Center’s chief administrative officer for 18 years, playing an instrumental role in leading the cancer center to designation by the National Cancer Institute (NCI) and building what has become a cancer care and research powerhouse. On June 29, Stiles retires, departing the cancer center for other saddles — the ones she puts on Max Chulo and Eagle Dance, her geldings at her ranch in Placerville. Stiles joined the cancer center in 1999 to work alongside now-retired director Ralph de Vere White, dazzled by the director’s infectious energy, enthusiasm and ambition. In her role as chief administrative officer, Stiles also was fully engaged in the cancer center’s clinical operations, and never hesitated to deal directly with patients’ concerns, whether parking, getting an appointment or an issue specific to their treatment. With Stiles’ breadth of experience putting large grant proposals together at UCLA, she became the perfect partner for de Vere White, who was adept at corralling disparate groups of researchers to build a scientific program that would impress the NCI. Equally animated and passionate about everything cancer, the two are close friends and mutual fans. Richard Bold, professor and chief of surgical oncology, calls Stiles a stalwart supporter of the cancer center. Earning the NCI’s prestigious comprehensive designation in 2012, the cancer center today comprises more than 300 scientific members from across UC Davis and the Lawrence Livermore National Laboratory. The center boasts more than 300 cancer research projects and $60 million in external research funding. Stiles came to UC Davis from UCLA, where she held administrative leadership posts at the School of Theater, Film and Television, Department of Microbiology and Immunology and the AIDS Center, for which she helped win a $38 million clinical trials grant from the National Institutes of Health. She also worked at the university’s Office of Research as the director of R-NET, a software development project for research administration. Leaving the cancer center with a strong administrative infrastructure for the next director has been her goal. “I want my successor to come in and say, ‘Wow, this person knew what she was doing,’” she says. With her husband, Dan, Stiles looks forward to travel, yoga and getting herself and her beloved horses back into endurance riding condition. “I’d like to get first place in the western region for limited distance — 25–30 miles — on a horse,” she says. With Stiles in the saddle, Max Chulo and Eagle Dance will surely be champing at their bits.